Ed O'Brien has spent almost three decades mixing high art with rock and roll as a member of Radiohead, and his playing has always pushed the frontiers of what an electric guitar can do. Ed seems delighted to challenge people's preconceived notions of what "guitar music" is, and his new signature Strat reflects his desire to innovate. The unorthodox electronics setup lets you make some of the coolest sounds you'll ever hear with very little tinkering. The neck pickup is a Fernandes Sustainer, and you can control its level with the mini-toggles on the lower bout. The switch on the right turns the Sustainer on and mixes it in with whatever pickup you have selected. Having the ability to kill or start the sustain instantly makes it really easy to smoothly incorporate this effect into live performances! The second toggle lets you dial in just the fundamental, just the harmonic, or a blend of the two, and the second volume knob controls that blend. This means you can access a vast array of sounds that range from subtle to in-your-face in seconds! This is the sort of guitar that can easily steal many afternoons from you, because it practically demands that you set aside more pressing matters to explore the new compositional techniques its electronics present. Now, all this talk about crazy pickups and switching begs the question: how does it sound when you want to use it as a "regular" guitar? 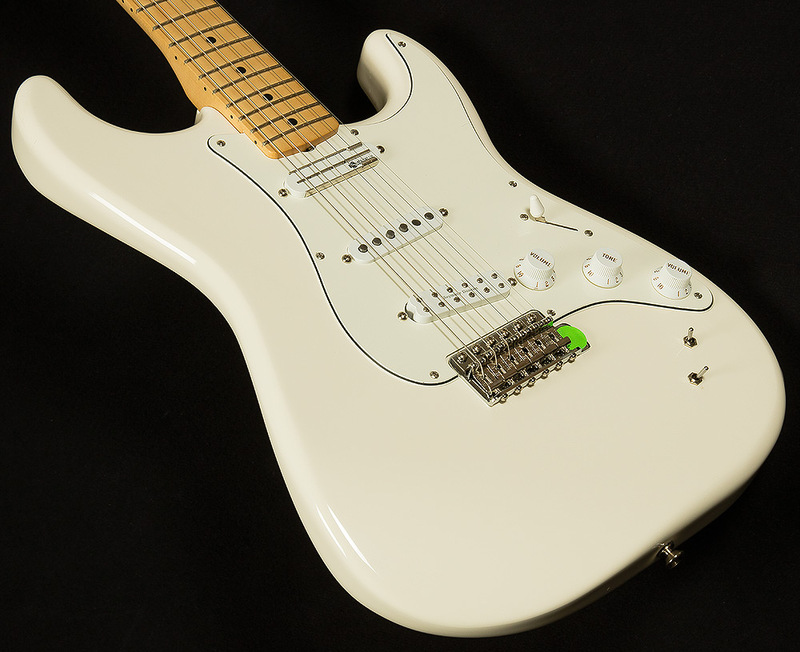 Well, you don't necessarily need to even use the Sustainer to have a blast with this Strat. The bridge pickup is a fat-sounding JB Jr. humbucker and the middle pickup is a bright, spanky Texas Special. This juxtaposition of different voicings means that this guitar is incredibly versatile. Oh, and it feels great in your hand, too, thanks to the gloriously chunky 10/56 "V" neck profile. And, if signature models aren't your thing, have no fear: Ed's name and signature don't appear anywhere on the guitar. Instead, he had Fender engrave a tasteful "Flower of Life" into the neck plate. The Wildwood Team plays an awful lot of cool guitars, and we all agree: this EOB Sustainer Stratocaster is one of the most inspiring instruments we've ever seen, and we are excited to see what new musical ground our exceptional customers will break with it.